The Roper Lake hot tub is closed. We are working hard to get it back in working order and apologize for any inconvenience. 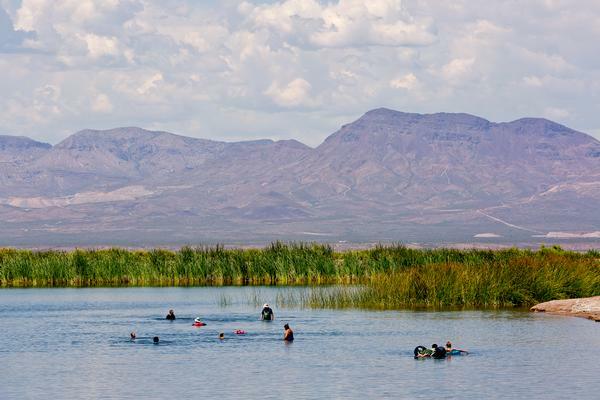 Roper Lake State Park is located 6 miles south of Safford in Graham County in southeast Arizona. In 1974, under a management agreement with Arizona Game and Fish Commission, Arizona State Parks and Trails opened Roper Lake State Park to facilitate outdoor activities including hiking, camping, swimming, and fishing. Dankworth Pond, three miles down the road, was purchased by State Parks in 1975 and is managed as a fishing destination. Roper Lake is comprised of a 30 surface acre lake and Dankworth Pond is comprised of a 15 surface acre lake. The Roper Lake-Dankworth Pond complex totals just over 338 acres including 20 acres of leased Bureau of Land Management property adjoining Dankworth Pond. Elevation at Roper Lake is 3,130 feet. The Roper Lake-Dankworth Pond complex is bounded by a mix of agricultural land and Chihuahuan desert scrub. Characteristic or representative shrub species of the Chihuahuan desert scrub include cresosotebush, tarbush, mesquite, agave and ocotillo. There is only one “endemic” plant species called lechugilla. The Chihuahuan Desert has a great diversity of wildlife species stemming from the riparian habitats, ephemeral streams, lakes, and sub-surface water aquifer. Roper Lake’s hot spring flows through a man-made structure and then out of a pipe and into a wetland containing two large, cattail encircled pools before entering the lake approximately 800 feet downstream. Roper Lake-Dankworth Pond complex is home to five species of amphibians, one turtle species, nine lizard species, 10 species of snakes, 28 species of dragon and damselflies, and over 60 species of birds. Common mammal species such as collared peccary, desert cottontail, grey fox, and mule deer, raccoon, and coyote are present within park boundaries. A large variety of other interesting Arizona wildlife species can be found within the park and offer year-round wildlife viewing opportunities. Native habitats, endangered species and plant community composition and diversity are impacted by the occurrence of less desirable native and non-native (also known as invasive) plant and animal species in Arizona. Problem non-native invasive species, due to their potential to invade an area and cause adverse ecological impacts found at Roper Lake–Dankworth Pond includes saltcedar, Russian olive, Bermuda grass, mosquitofish, and green sunfish. The cattail is a problem native invasive species, due to its potential to spread rapidly closing open water, reducing or eliminating wildlife habitat, reducing plant and animal species diversity, and decreasing water level stabilization. Looming to the west of Roper Lake State Park are the Pinaleño Mountains which offer park visitors exciting forays into Arizona's varied and diverse landscapes. Mount Graham at 10,724 feet is the highest peak within this beautiful range, and can be accessed by taking Hwy 366 right from the park! Exploring these mountains and watching as the habitat changes from desert to forest right before your eyes is an amazing experience. Coues whitetail deer are common on the mountain, and visitors often bring back stories of encounters while adventuring. Also, the endangered Mount Graham Red Squirrel is carving out an existence on this sky island and is a welcome sight to visitors venturing into the higher elevations of the area. Next time you're at the park, take a trip up Mount Graham to expereince even more of what Arizona has to offer! Gates are closed from 10:00 p.m. - 6:00 a.m.